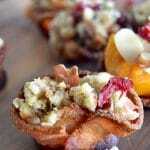 You are here: Home / APPETIZERS / Leftover Stuffing Bacon Cups: Creative Leftovers! 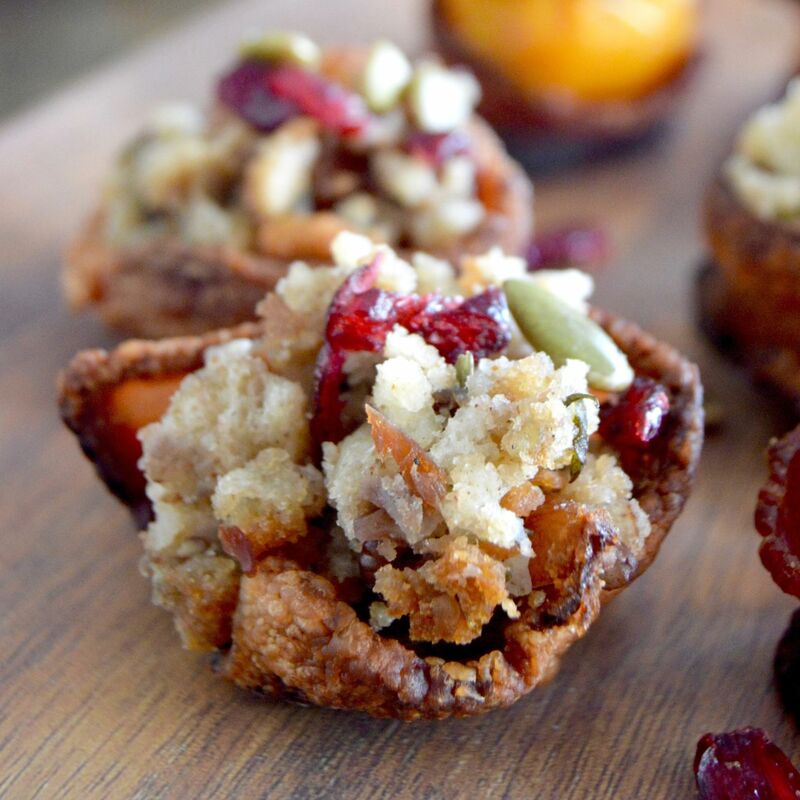 Leftover Stuffing Bacon cups will use up all your leftover stuffing! Make bacon cups, spoon the stuffing in, top with some cranberries and nuts and you have a delicious bite sized snack! The big Thanksgiving feast is over and now you have all sorts of things in the fridge. 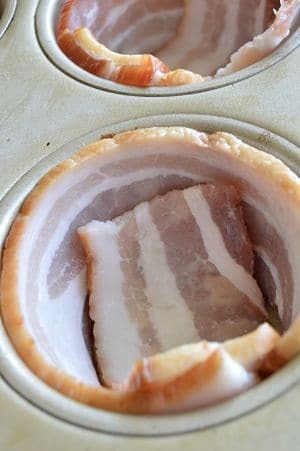 This recipe for Leftover Stuffing Bacon Cups is a great way to make some bite sized appetizers using up some of the sides in a totally different way. We usually watch football on the Friday after Thanksgiving and have a few people over to watch with us. 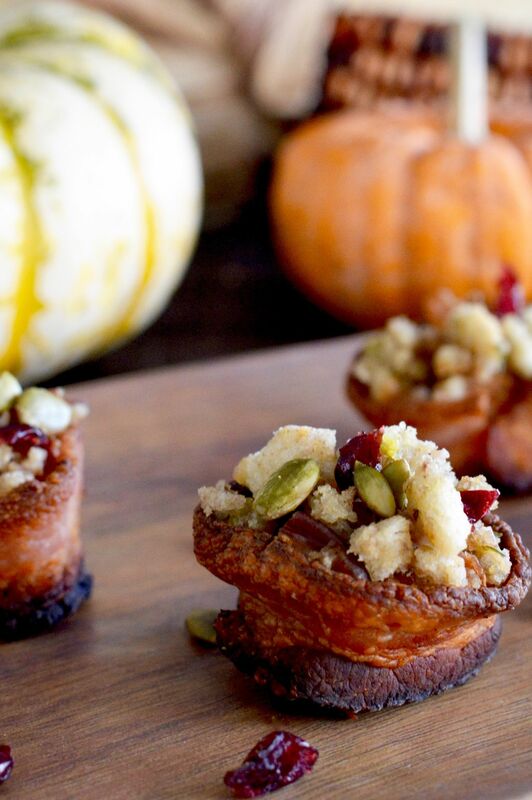 You can serve these Leftover Stuffing Bacon Cups as bite sized snacks throughout the game. You can do the same thing with any leftover sweet potato Casserole like I have done here. They are both super easy to make, because all you have to do is make the bacon cups….. the rest of the ingredients for the Leftover Stuffing Bacon cups are leftovers from your Thanksgiving festivities! (hello…. now is that a win or what? I usually add a few colorful toppings like pumpkin seeds, cranberries (although if you have any cranberry sauce leftover you could drizzle that over the top too. For the sweet potato bacon cups I usually sprinkle some almonds and brown sugar. If you like bacon cups, check out my other recipes for Bacon Mac & Cheese Cups Bacon Potato Nests and baked bean Bacon Cups! Points of Interest of Leftover Stuffing Bacon Cups! Easy/Hard? Easy. The filling was made ahead and you’re using leftovers so all you have to make is the bacon cups. 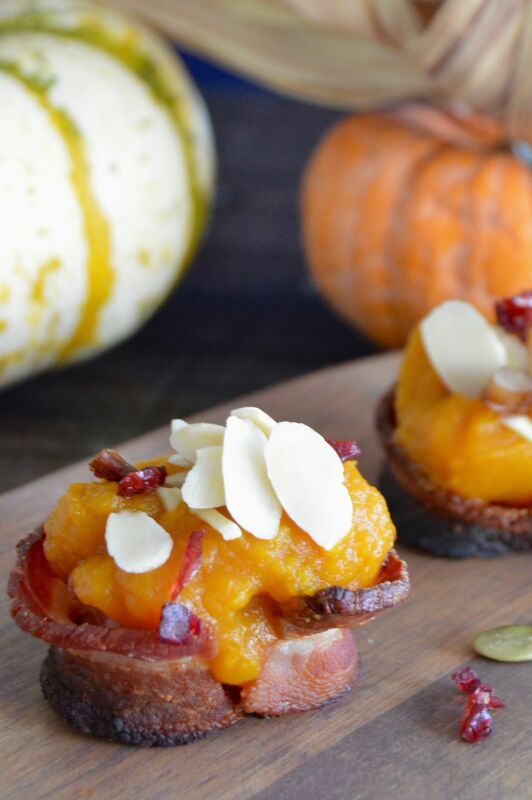 The hardest thing about this recipe is not eating all the bacon cups before serving them. Make Ahead? 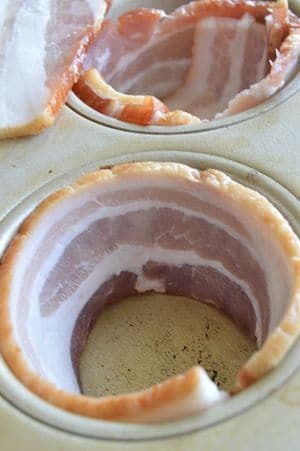 The bacon cups are much better if made just before serving. Although in our house I have been known to make them in the morning and just reheat them when warming up the filling. Serving Suggestions: Use for a cocktail party as bite sized appetizers. You can have the common thing be the bacon cups and fill with all sorts of fillings, stuffing, mashed potatoes, mac n cheese, sweet potatoes! Each two pieces of bacon yields 3 bacon cups. Take 16 pieces of bacon and fold them in half so that each piece is about 8" long. Take 8 of those pieces and cut them in half once again. (finished pieces are about 4" long. Take the longer pieces first and line the edges of a muffin tin. Cocktail Pairings: I love these with a glass of red wine (Im currently loving all of the beaujolais nouveau that is out currently!) They also work with my favorite seasonal cocktail the Hard Apple Bourbon! This in Pinterest… it’s adorable!! And yummy! Very yummy. What a great idea! Stuffing and bacon- 2 of my favorites. I think I could absolutely eat two or three of these — hand to mouth! Sweet moses, this is such a good idea! For one thing, bacon makes everything better, and for another, miniature bites like this are the cutest! I completely agree Elizabeth! Bite sized BACON things are the cutest! Such a wonderful use of Thanksgiving leftovers! I have never tried lining muffin tins with bacon before. It looks incredible. My husband would go absolutely crazy over these.